Panch Phoron literally means 'five spices.' It is a blend of five commonly used whole spices from the Indian Kitchen and consists of cumin, brown mustard, fenugreek, nigella and fennel seeds. Mix all all the seeds and store in an air tight container. To use, either dry roast or fry these seeds in a little oil. Panch phoron is used in many dishes from the Bengali and Bangladeshi cuisine. Stir fry potatoes or karela or pumpkin in a teaspoon of panch phoron for a delicious bowl of goodness. 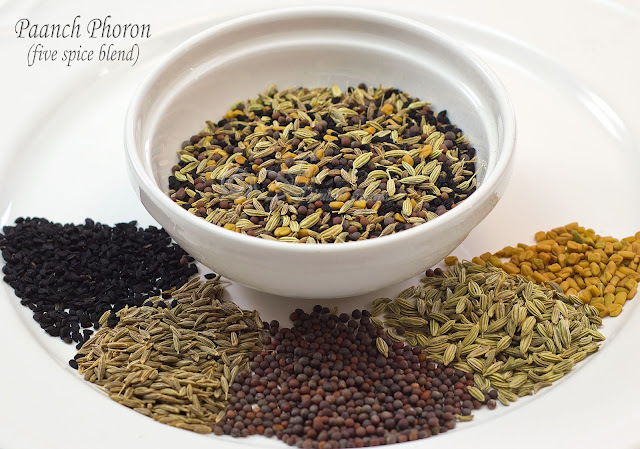 Panch Phoron is usually a mixture of equal amounts of each spice. I choose to use less fenugreek because of its bitter taste. Feel free to increase the quantity if you like. Combine the seeds in a small bowl. Store in an airtight container. Depending on the dish, either fry briefly in oil or dry roast these seeds to bring out the flavor.